"Personalized Grandmother's Ring, All I Ever Wanted Name Ring"
Who has made all your dreams come true? This ring is a wonderful reminder of those who have changed your life forever. 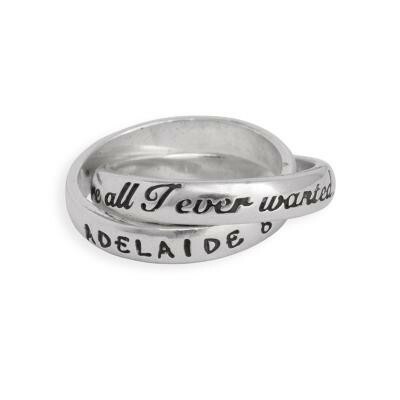 The personalized grandmother's ring with the words, "You're All I Ever Wanted".... says it simply and sweetly. What a wonderful way to keep your grandchildren wrapped around your finger. One ring has written in script "You're all I ever wanted…". The other band can be stamped with up to 18 characters/spaces.